Submitted by jermz on Thursday, August 17, 2006 - 2:45pm. So one day, I’m extremely hungry and with Dennis. What else is there to do other than eat out in Mira Mesa with all of the great small businesses? 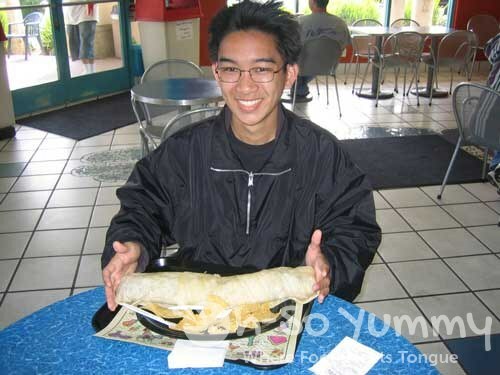 He tells me about a great burrito thats larger than my forearm for only $6. Unbelievable! I had to see it for myself. My first encounter with the El Grande was at a restaurant called Cotija’s. Waiting for the burrito to be put together took awhile, but when you see it you’ll immediately know you got your time and money’s worth. The El Grande is not only 14″ long but also has a massive girth. How long I’m not sure; I didn’t bust out a measuring tape. “HOLY CRAP!” was my first impression. It’s composed of two tortillas, beef and potatoe wedges from top to bottom, and a few dashes of lettuce. Becareful how you eat it! Because all of the contents can spill out if you’re not careful. If someone dares you to finish it on the first try, please reconsider. I only finished about 60% of it. Of course, if you don’t finish you could always wrap it up, stick it in a box and take it back home. Dont try to hold this up and eat it… or else it will rip right in the middle!! BTW. You described the El Grande at Cotijas. The El Grande at El Patron has Steak, Chicken, Rice, and Mushrooms. Very good. i took that picture! go meeeee!